I have always wanted to try out a winemaker's dinner and what better than to try one of the various events that Purple Cafe & Wine Bar (@heavyrestaurant) hosts. Purple has had a few of these dinners recently and they always look amazing. At Purple Seattle, there is a beautiful back room behind the bar area with windows all around and a beautiful wood table that can sit the entire group in attendance. 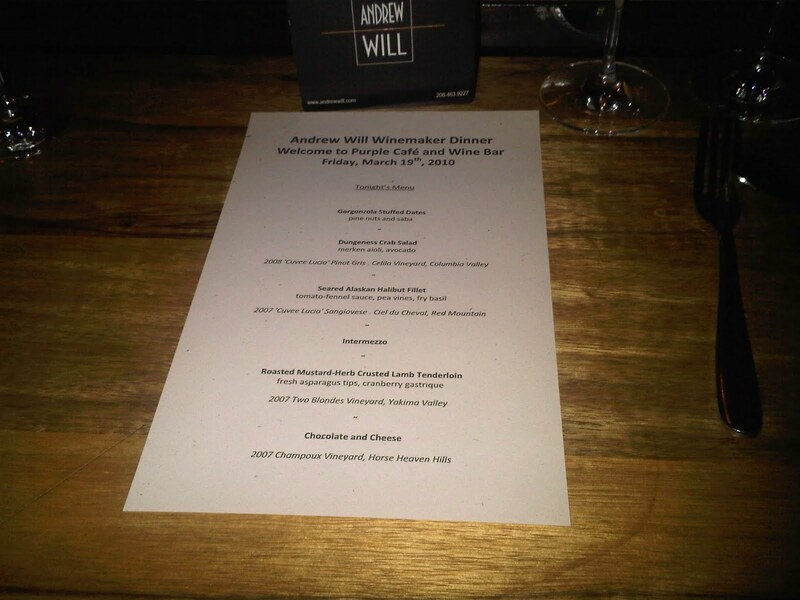 The dinner on this night was for Andrew Will Winery (@andrewwill), a winery located on Vashon Island. 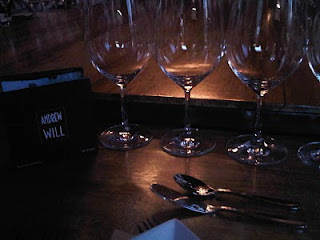 I had never had a chance to try Andrew Will wines before so I was even more excited about the dinner. We (I attended along with @jenkmiller) arrived and were immediately handed a yummy glass of prosecco. We took our seats at one end of the big table and got to chatting with all the great people in attendance at the dinner. It was so great to learn about the winery and how it got started. Their grapes are grown in eastern WA, and while they don't currently have a tasting room on Vashon Island, there was talk that one may open up sometime in the future near their vineyards. The meal started with Gorgonzola stuffed dates which were simply amazing. They were topped with pine nuts and the perfect start to the meal. We moved from there to a dungeness crab salad with avocado. This was paired with Andrew Will's 2008 Cuvee Lucia Pinot Gris. This was a light refreshing wine that was an excellent match for the crab and avocado combination. 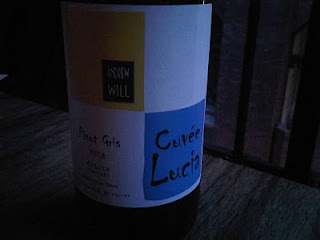 This was a great spring and summer wine that would likely pair well with any type of salad or BBQ fare. 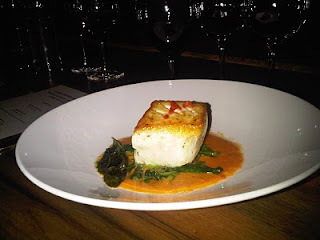 Next we moved on to a seared Alaskan halibut fillet served with a tomato-fennel sauce. This paired nicely with Andrew Will's 2007 Cuvee Lucia Sangiovese, a red mountain wine. Growing up in Alaska, I have had a lot of halibut cooked in various different ways. The cut and preparation of the fish by Purple at this dinner was incredible. It was perfectly flaky to the fork and so amazing with the sauce. The sangiovese was by far one of my favorites of the evening. 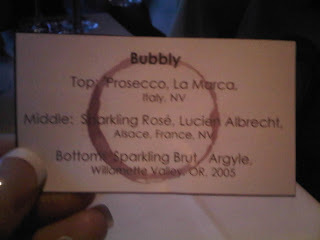 I need to go find a bottle of this to add to my collection and enjoy it with some of the halibut from my freezer! It was such an amazing pairing I look forward to trying again. 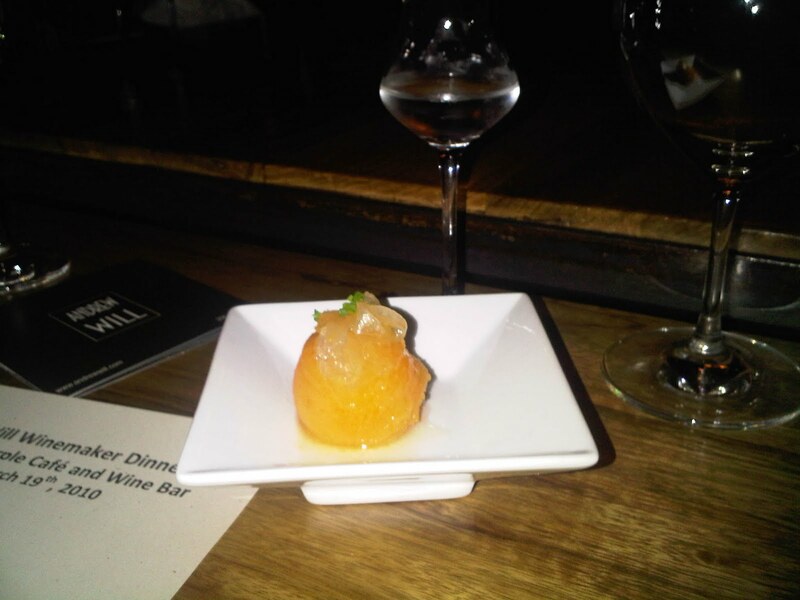 Our "intermezzo" of the evening came with a small bite of papaya sorbet along with a shot of potato vodka. This was to cleanse the pallet before moving on to our next course. It definitely did the trick and my mouth was free of all of the other wines we had already tasted. It was a great way to ready myself for our next amazing course. 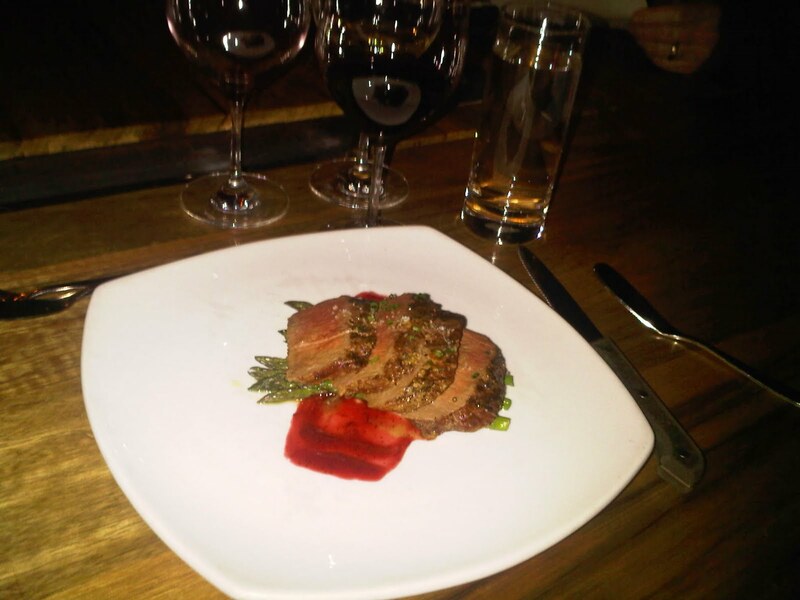 Our next course was roasted mustard-herb crusted lamb tenderloin served with asparagus. 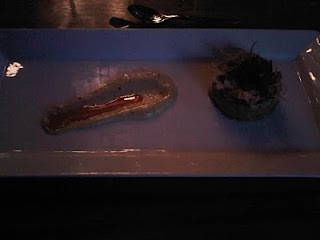 This course was paired along with Andrew Will's 2007 Two Blonds Vineyard blend from the Yakima Valley. This wine was a blend of 40% Cabernet Sauvignon, 34% Cabernet Franc, 19% Merlot, and 7% Malbec. 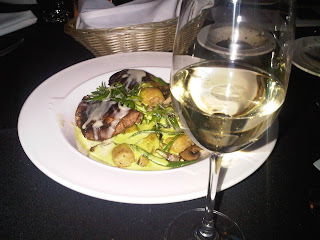 The combination of the tenderness of the lamb and the softness of the wine was such a treat. Our dessert of a Delice cheese and chocolate paired with Andrew Will's 2007 Champoux blend from Horse Heaven Hills was the perfect finish to this amazing meal. This blend is 19% Cab Sauv, 52% Cab Franc, 21% Merlot, and 8% Petit Verdot. The large percentage of Cab Franc in this wine really stood out in an amazing way. I had never had the variety of cheese served with this and I must say I have a new favorite! At the end of the meal I was full but not overly, as the portions served with the meal were absolutely perfect. It was interesting to learn about how the chef creates the food pairings to work with the wine, not the other way around. 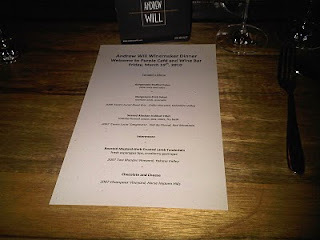 Both the food prepared by the chef at Purple and the Andrew Will wines tasted were so fantastic and I can now say I'm hooked to the concept of food and wine pairings. 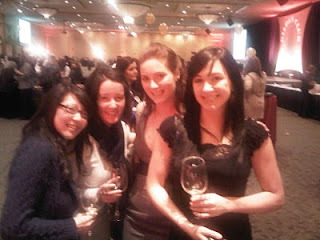 I will be in attendance at more winemaker's dinners in the future for sure. They always say it’s all about who you know and this came in very handy this past week as I was able to attend a great event. 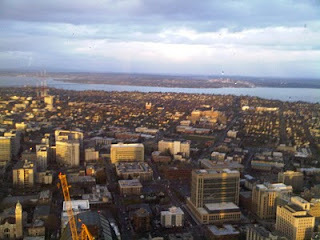 My friend Jen (@jenkmiller) is a member of the Columbia Tower Club and Wine Society (@columbiatower), which is located on the 75th floor of the Columbia Tower, the tallest building in Seattle. The views from here are AMAZING and on a beautiful day I don’t know that there is any place better to get a view of the entire city of Seattle. The CTC’s Wine Society holds monthly wine tastings and this month showcased Washington Wines to celebrate Washington Wine Month. There were 70 wines being poured at the tasting, which featured both wine distributors as well as winemakers in attendance. There were several wineries at this event that I had yet to try and was excited to see such a wide variety of WA wineries featured here. A big favorite was Guardian Cellars, owned by Jerry Riener. Jerry was pouring at the event and was able to give me all the background about each wine and how the winery came to be. For Jerry the winery is actually a side project, he has a full-time job in law enforcement in the local Seattle area. This is a running theme with his wines, with names such as “Gun Metal” and “The Wanted”. It’s so great to see a story behind each of his wines and the names he uses for them. My personal favorite of the Guardian Wines was his 2009 Angel Sauvignon Blanc, which made me instantly visualize a warm summer day on the porch kicked back with a glass of the wine and some BBQ type snacks. This wine will no doubt go fast. I purchased a bottle of this through the event, but now I’m thinking I need to stock up on this! Jerry mentioned that his release party was the next day for some new wines. His tasting room is located in Woodinville and will remain open this summer only as long as he has wine left! Once this year’s batch is gone, it’s gone, and the tasting room shuts down. I need to get out there quick and taste through the entire line again as it was such a treat to chat with Jerry at this event and learn about his wines. Another winery that I have always liked, Barnard Griffin, was pouring the brand new 2009 release of their Rose of Sangiovese. I have been a huge fan of their Rose in previous years, and this release was the best one yet. The flavors blended very well and nothing stood out too significantly alone, which is what makes it so enjoyable. This is another one of those wines that makes me wish it was summer already and not still March! I look forward to drinking this one throughout the summer months. I was also able to meet and briefly chat with the owners of William Church Winery (@wmchurchwinery), which is located in the Woodinville Warehouse District. I have seen them on twitter in the past and it was great to meet the people behind the wines. I was a big fan of their wines poured at this event and will hopefully be visiting the tasting room soon to check out more of their wines. One of the best things about this event was that all of the wines poured were made available for sale at a cost a little above wholesale. Though we didn’t get to leave the event with our purchases, I am excited to pick up my new bottles when they come in! These tasting events are a huge perk of being a CTC member and Wine Society Member. Definitely something to look into! 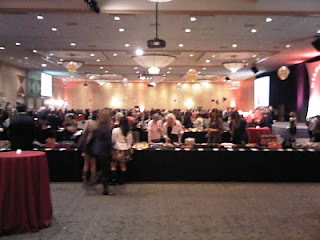 On March 14th, 2010 I had the chance to attend the “Bags & Bottles” event at the Westin Seattle. This event, put on my local sommelier David LeClaire, Wine Events & Promotions, and Seattle Uncorked, benefited Gilda’s Club Seattle (@gildasclubsea). Gilda’s Club is a non-profit support network for the families and friends of those living with cancer. It was named in honor of SNL comedian Gilda Radner, who died of ovarian cancer in 1989. Gilda’s provides support and networking groups, lectures, workshops, and social events. The event contained a live auction of several celebrity handbags as well as a silent auction of items donated by attendees and others. There were quite the array of handbags at this event, and I found a few that I bid on in the silent auction, but sadly didn’t have the highest bid. There were also a few handbag retailers on site and I did end up finding a great wallet/wristlet type bag that I have already used a few times since the event just a week ago! 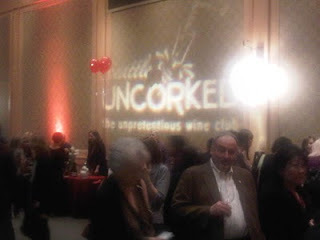 Of course, my favorite part of the event was the wine. There were a ton of wineries in attendance at the event, including some that I had tried in the past and was eager to try again. One of the nicest things about this event was that each winery had up to two of the bottles they were pouring there available for sale. All profits from the sales benefited Gilda’s Club as well. I am a huge fan of purchasing something I love (wine) for a good cause so I definitely left with four bottles from this event. One I ended up with was the Gilbert Cellars, (@gilbertcellars) 2006 Allobroges, a fun red that I knew I wanted a bottle of after the first taste. 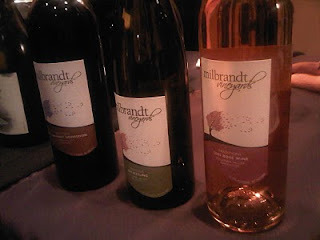 I had been able to taste Gilbert Cellars wine at a wine & chocolate event a few months ago at 106 Pine (@106pine) a new wine shop on Pine St near the Pike Place Market. I was excited to try more after the wines I was able to try at that event. A second bottle I took home was the Sojen Cellars (@sojencellars, @sojengirl) Syrah. 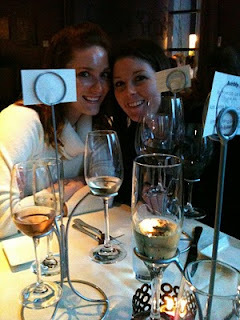 I mentioned in my past blog post about Max & Jen, owners of Sojen Cellars, and how wonderful they are. Jen was in attendance at this event and told me about a winemaker’s dinner they will be having at Russell’s in Bothell on April 22nd. I got myself on the list for this one and will be looking forward to trying more of their wines paired with the amazing food at Russell’s. Look for more details on this dinner at Russell's Events Page. 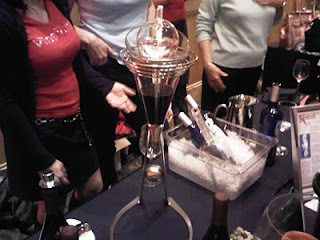 Another neat item they had at the Sojen table was an Italian decanter. Watching them pour tastes from this was pretty neat and I had never seen anything like this before. Another tasty wine I purchased was a Renwood Winery 2006 Sierra Foothills Zinfindel. I had been able to try Renwood at a recent “untweet-up” with some wine friends and was happy to see Renwood at this event also. This is a great bottle with a great price! I hope to try more of their wines soon. My final purchase was a Wilridge Winery ’06 Klipsun Vineyard Red Mountain Nebbiolo. This was another one of those wines that I knew from the first taste that I wanted more. It was a well rounded wine and I look forward to trying it with an upcoming meal (or just on its own!). Other favorites I tried at this event included a Milbrandt Vineyards (@milbrandtvino) 2008 Rose (which I discovered at the Seattle Food & Wine Experience); Zerba Cellars(@zerbacellars) Cab Franc (would have purchased but it wasn’t for sale at the event); and Northwest Totem Cellars (@NWTotemCellars) 2006 Elderling Vineyard Syrah (I was finally able to meet winemaker Mike Sharadin, great guy!). Overall, this was a very fun event and contained a mix of two things I LOVE which are wine and handbags. Throw in the fact that it’s for a great cause, being able to meet new winemakers, and spending time with some good friends (@seattlewinegal, @jenkmiller, @BlackPearlSEA) and you have an excellent afternoon! I look forward to checking this out next year also. 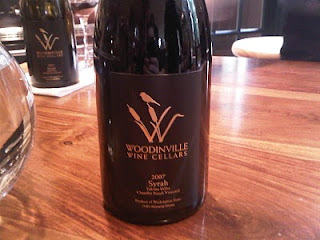 I have tasted in Woodinville once before and we hit some great wineries. On this somewhat sunny afternoon, @seattlewinegal and I decided to hit a few tasting rooms together. 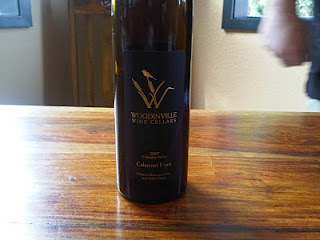 Our first stop was Woodinville Wine Cellars, who was having their spring release party. I needed to stop in here to pick up my wine, as I'm a wine club member. 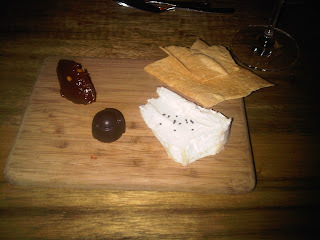 As part of the spring release party, there were several cheeses to try along with the wine releases. There are few things I love more in this world than wine and cheese. Yum. The release I picked up here included two excellent wines: an '07 Cab Franc from Conner Lee and Chandler Reach vineyards, as well as an '07 Chandler Reach Syrah, which is Woodinville Wine Cellars first ever single vineyard Syrah. Both were excellent wines, and I look forward to opening my wine club shipment bottles in the future. We had a chance to chat a bit with the wine maker, Sean Boyd, who was very excited about both releases this spring. Another wine of theirs that I stock up on at each visit is their Sauv Blanc, it's just a great Columbia Valley white that goes great with any occasion. I have a great time at each visit to the tasting room here, I am so glad I joined this wine club last fall. After leaving Woodinville Wine Cellars we headed over to the warehouse district. I have never tasted in the warehouse district before, and it's amazing just how many wineries are in this small area! 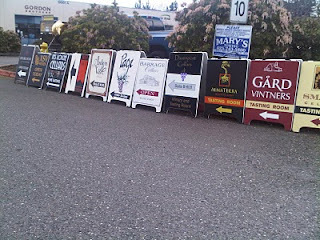 It was great to see the signs all lined up side by side as we turned the corner into the area. Our first stop was Barrage Cellars, which is a favorite of @seattlewinegal. I was excited to meet winemaker Kevin Correll and his wife Rebecca. It was hilarious to see Rebecca trying some pilates right as we walked through the door. Both were so inviting and full of such enthusiasm. The tasting room filled immediately after we arrived, I couldn't believe the crowd! I had been able to try their Trifecta Merlot at a recent event and was very excited to try additional varietals. Look for a full blog post on their '07 Outcast Cab Franc coming soon. They were kind enough to send a bottle with me to review! We headed out of Barrage (it was hard to leave, they are just so fun!) and wandered over to Smasne (not a far walk, one of the great things about the warehouse district!). 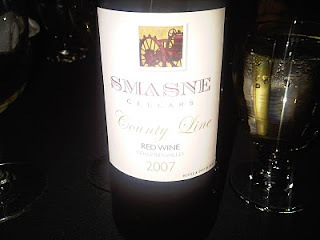 I was able to try several Smasne wines, which were all fantastic. I left with bottles of the '06 Malbec, '06 Konner Ray Red, and the '07 Rosella Rose. Had a chance to chat with Bart Fawbush of Bartholomew Winery, who was pouring in the tasting room. His new tasting room in Seattle is set to open in May 2010, can't wait to visit! Our afternoon went faster than we hoped and most tasting rooms close at 5pm so we headed out of the warehouse district and over to Russell's to get some food and wine. As always, Rob Williamson (GM at Russell's) took such AMAZING care of us. This is now one of my favorite restaurants in the area, and worth the drive to Bothell to check it out. Seriously. Amazing. Everything that came out of the kitchen was fantastic and the company was just as wonderful. Met up with Max and Jen Jensen of Sojen Cellars, who are such great people! They brought a few bottles of their wine (some of which I had tried previously), and I was able to learn more about their winery, name (stemmed from a nickname of Jen), and location (they are in Everett). Looking forward to visiting their tasting room sometime in the near future. It was a nice Saturday afternoon and evening in Woodinville, looking forward to many more to come! I have now visited Sip Wine Bar (@sipwinebar) in downtown Seattle four times, and every time has been very enjoyable. 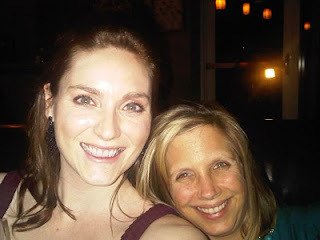 My favorite night to visit is Thursday, where it's "ladies night" all evening long and all wine flights are 1/2 off. I must say, their wine flights are one of my favorite things about Sip. The come in the most adorable little wine tree looking things with a great little description of each wine in the order they are placed on the tree. A go-to flight for me has been the "Call me a Cab" flight because it contains some very tasty WA Cab Sauvs. 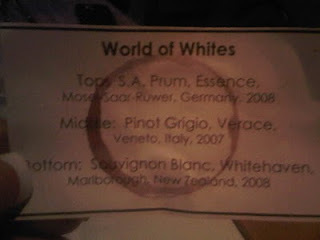 On my most recent visit, I branched out (how fitting a reference to the "wine trees") and tried the "Bubbly" flight as well as the "Word of Whites" flight. I was impressed with the wine choices for each of these flights. I'm a huge fan of using the words "yummy" and "tasty" when describing wines and both flights were indeed that. 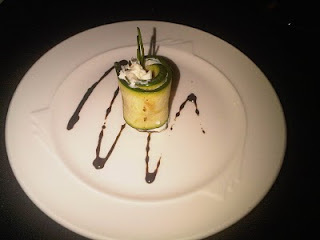 And the food.. since I always go for happy hour time, I have always ordered from the appetizer menu. I am a HUGE fan of the sliders at Sip. The sauce on them and Hawaiian sweet roles used for the bread is such an excellent combination. I highly recommend these! The crab cakes are also quite good. I need to try new things the next time I'm in, I always seem to get the same thing every time I visit! Overall, Sip Wine Bar is a great place to check out for happy hour, and (I'm assuming, can't really judge since I haven't tried yet) dinner. Looking forward to warmer weather when I can try out their patio. Great views of the downtown area and the beautiful Seattle Public Library from there. Hello there! I will start by saying that I am not a professional blogger, nor do I want to be. I have a day job already! Wine tasting and attending wine events has become sort of a hobby of mine and it's been so wonderful. I just figured that if I love wine and wine tasting so much, why not share this with others who may be looking for the next great bottle? I have had so many wine adventures recently that I thought I should start documenting them, more so than on just twitter. This blog will have posts about events, brief reviews of wines I try (with photos), and an overall fun casual feel about my quest to learn all there is to know about wine. I have made such great new friends in the industry lately and have already learned so much. I can't wait for the adventure to continue!